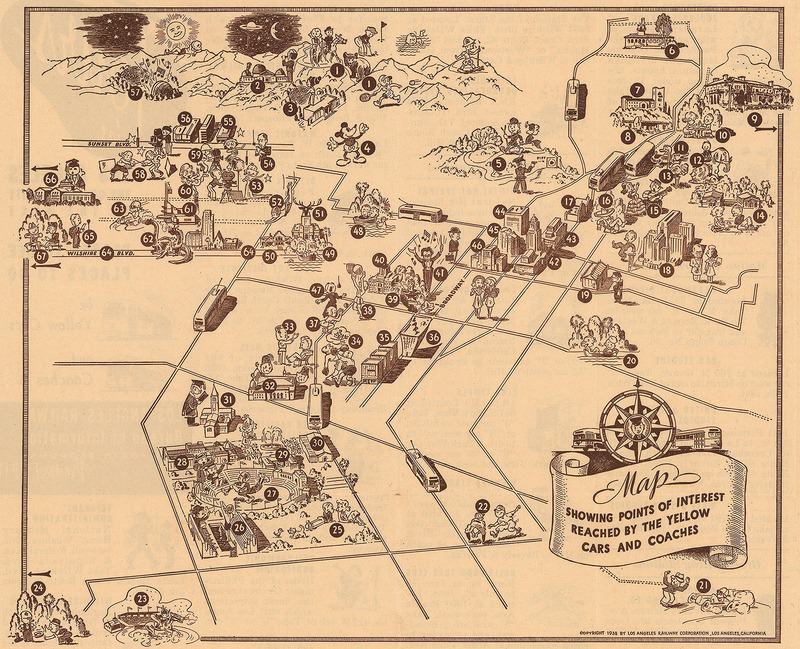 When local history lovers envision the quaint Los Angeles of years past, they often recall Pacific Electric’s sturdy red streetcars rolling all over the city and beyond to deliver Angelenos to the delightful attractions seen on this adorable map (probably done by Ruth Taylor White). The draws of our fair city include culture and art, history, higher education, parks, animal amusements, motion pictures, radio and even prominent architectural creations. As a typically optimistic travel-boosting map, this one paints a cozy picture: notice the Southern California sun grinning from above the San Gabriel mountains and the moon (and Saturn?) casting their spell over the city’s nightlife. Race cars roar at Ascot, an L.A. Angel prepares to slide into third at Wrigley field, an uncaged bear seems to roam the hills of Griffith Park, and Leopold Stokowski wields the baton downtown at the Philharmonic Auditorium—attractions all made available and accessible thanks to the wonderful public transportation provided by the Los Angeles Railway’s under-appreciated Yellow Cars and motor coaches. The less romantic-sounding Yellow Cars carried three times as many riders than the Pacific Electric despite serving only a six mile radius around their downtown headquarters (1050 South Broadway). In their heyday, LARY had twenty lines, with 1,250 cars that rolled along on 642 miles of track. The Yellow Cars reached neighborhoods like Echo Park, Westlake, Hancock Park, Exposition Park, West Adams, Crenshaw, Vernon, Boyle Heights, Lincoln Heights, and my own dear South Gate (via the loop in Huntington Park). The Los Angeles Railway’s roots can be traced to 1895, when it competed with an abundance of street rail competitors in a streetcar-obsessed L.A. After a merger with the Main Street and Agricultural Park Railroad, LARY was purchased by Henry Huntington in 1898 and brought up to speed by 1901. 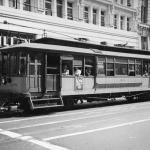 It was that year when the lines opened up the city and became the primary source of public transit within its limits. 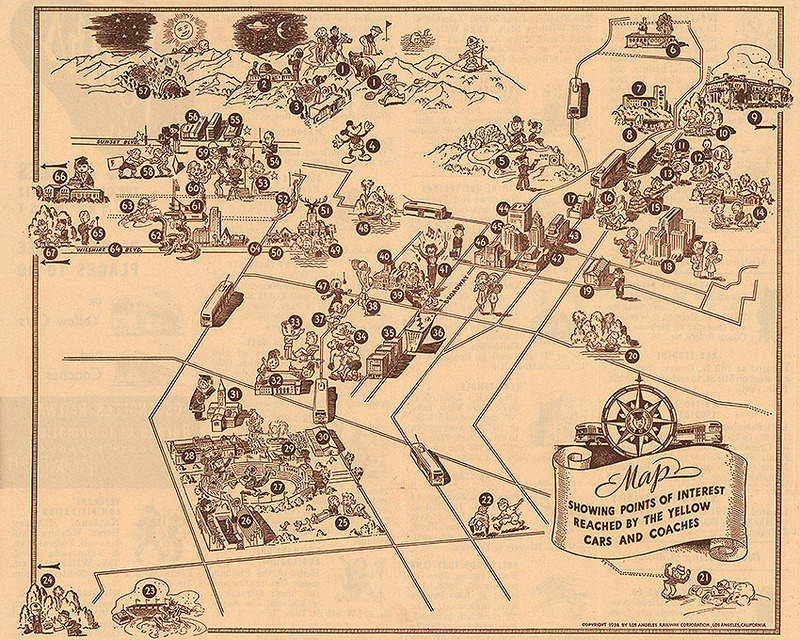 Unlike the jocular map seen here, however, Los Angeles in 1938 was far from a cheerful place. The area was still reeling from killer floods in February and March that killed 115 people and caused terrible property damage. The same sweet-looking trolley cars on the map spawned a blitz of criticism from Angelenos because of overcrowding, inadequate safety measures, and a lack of proper staffing. The vehemently anti-union sentiments of Henry Huntington held sway over LARY-busting strikes in 1901, 1910, 1919, and a back-breaker for labor in 1934. By the 1930s, the old streetcars were being neglected and were so short-staffed that only one man was left to deal with cars covered inside and out with disgruntled riders. After numerous attempts to turn the service into a municipal operation in 1935, 1937, and 1939, the Los Angeles Railway was sold to National City Lines, a front for Firestone Tire and Rubber, Standard Oil, and General Motors who sought to convert all to gas-burning buses. It took World War II and the labor shortages symptomatic of that dark time that finally allowed for a successful worker strike. 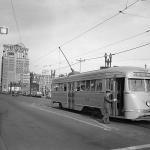 The Los Angeles Transit Lines rumbled on, mostly converting to buses and pulling up tracks until March 31, 1963, when the V-line completed its final run and rolled into the Georgia Street barn, the last streetcar seen on an L.A. street. Los Angeles Public Library map librarian Glen Creason shares a map from the Central Library’s collection at CityThink each week. Previous articleLaura Bush and Her Daughters Got a Special Preview of Oscar de la Renta’s Fall 2015 Collection in L.A.